We have developed Sesame, an architecture for efficient storage and expressive querying of large quantities of metadata in RDF and RDF Schema. Sesame’s design and implementation are independent from any specific storage device. Thus, Sesame can be deployed on top of a variety of storage devices, such as relational databases, triple stores, or object-oriented databases, without having to change the query engine or other functional modules. Sesame offers support for concurrency control, independent export of RDF and RDFS information and a query engine for RQL, a query language for RDF that offers native support for RDF Schema semantics. We present an overview of Sesame as a generic architecture, as well as its implementation and our first experiences with this implementation. Don Box, David Ehnebuske, Gopal Kakivaya, Andrew Layman, Noah Mendelsohn, Henrik Frystyk Nielsen, Satish Thatte, and Dave Winer. Simple Object Access Protocol (SOAP) 1.1. W3c note, World Wide Web Consortium, May 2000. See http://www.w3.org/TR/SOAP/. D. Brickley and R.V. Guha. Resource Description Framework (RDF) Schema Specification 1.0. Candidate recommendation, World Wide Web Consortium, March 2000. See http://www.w3.org/TR/2000/CR-rdf-schema-20000327. Jeen Broekstra and Arjohn Kampman. Query Language Definition. On-To-Knowledge (IST-1999-10132) Deliverable 9, Aidministrator Nederland b.v., April 2001. See http://www.ontoknowledge.org/. Don Chamberlin, Daniela Florescu, Jonathan Robie, Jerome Simeon, and Mugur Stefanescu. XQuery: A Query Language for XML. 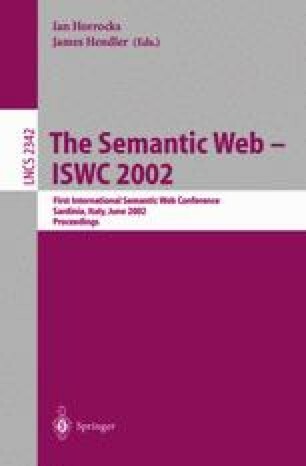 Working draft, World Wide Web Consortium, February 2001. See http://www.w3.org/TR/xquery/. Patrick Hayes. RDF Model Theory. Working draft, World Wide Web Consortium, September 2001. See http://www.w3.org/TR/rdf-mt/. Ian Horrocks, Frank van Harmelen, Peter Patel-Schneider, Tim Berners-Lee, Dan Brickley, Dan Connoly, Mike Dean, Stefan Decker, Dieter Fensel, Pat Hayes, Jeff Heflin, Jim Hendler, Ora Lassila, Deborah McGuinness, and Lynn Andrea Stein. DAML+OIL. http://www.daml.org/2001/03/daml+oil-index.html, March 2001. O. Lassila and R. R. Swick. Resource Description Framework (RDF): Model and Syntax Specification. Recommendation, World Wide Web Consortium, February 1999. See http://www.w3.org/TR/REC-rdf-syntax/. Libby Miller. RDF Squish query language and Java implementation. Public draft, Institute for Learning and Research Technology, 2001. See http://ilrt.org/discovery/2001/02/squish/.